Again, there’s no doubt—none, zero, zip—this will happen. The main question is when. Just a few weeks ago, I had hopes we could postpone it possibly even beyond the 2020 elections. It could still happen, but a barrage of data in the last few weeks suggest this may be more hope than reality. And as I constantly remind you, hope is not a strategy. Last week (and indeed for the last year), I talked about our growing debt problem and how it could trigger a crisis. Excessive leverage may light the fuse, but the real problems are deeper. A new report, just out this week, highlighted an important one. Debt can be useful when used wisely and wisdom begins with being able to repay it. So, if you have a debt-financed business, for example, you should have enough steady revenue to cover your other expenses and the interest on your debt—with a plan to reduce that debt. If you can’t, something is wrong. That’s a low bar… yet 12% of the public companies they examined couldn’t pass it. BIS doesn’t identify the companies by name. I suspect they are probably separate from the “unicorns” we hear about, which are mostly equity-financed by hopeful venture capitalists. In theory, bankers and bond buyers should be more risk-averse than VC investors, but that does not appear to be the case. Thousands of companies are going years with little prospect of repaying their debts, yet for whatever reason, the lenders see no need to stop lending to them, much less foreclose. Nor are these sketchy foreign companies. Looking only at US listed companies, about 16% qualify as zombies. 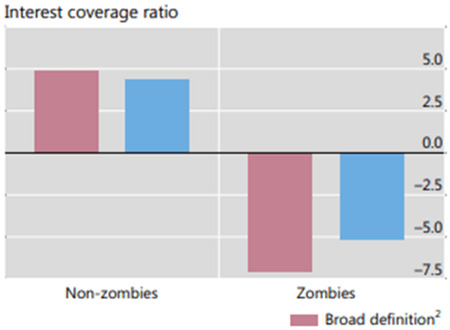 So, we are actually more zombie-friendly than our average global peers. Why lend covenant-light money to speculative firms like WeWork with the expectation they will repay? This is a relatively new phenomenon. 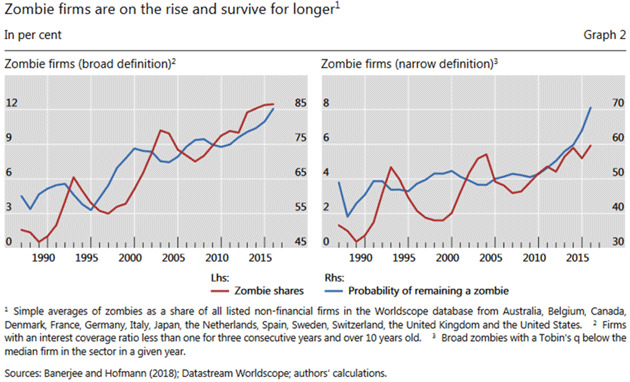 The red lines in the two charts below are the percentage of zombie companies, broadly and narrowly defined. In either case, it was close to zero in the late 1980s and has climbed steadily since then. Worse, once you become a zombie company, the probability of remaining one is high and rising. Not exactly something that should comfort lenders. Not coincidentally, it was about the beginning of this data when Michael Milken pioneered the junk bond (politely “high yield”) market, whose purpose was (and is) to make credit available to marginal companies not otherwise attractive to most lenders. Milken made them attractive by dangling high yields at potential bond buyers. This was supposed to compensate them for the higher default risk. It worked, too. Now it may be working too well. Are you getting all the tax savings possible from your IRA? Not one investor in a hundred exploits the full wealth-building power of their Individual Retirement Account. Having said all that, let’s assume for a minute the US avoids recession, or at least postpones it a few more years. That doesn’t mean the present boom will continue. Expansion/recession isn’t a binary choice. There’s lots of room in between, which means a lot of room for conditions to worsen without actually reversing. I titled this letter “Economic Brake Lights” because it’s a fitting metaphor. If you’re driving down the highway and the cars in front of you put on their brakes, they aren’t necessarily stopping. They are probably just decelerating, i.e. reducing their forward speed in reaction to conditions ahead. The other cars could be coming to a complete stop, however, so you slow down until you have better information. Likewise, we are starting to see businesses tap their brakes. The initial US GDP report showed continued growth in the third quarter, a 3.5% annual rate. That was good, but the report had some warning lights, too. Non-residential business investment grew only 0.8% annualized, a sharp deceleration from the first quarter’s 11.5% rate. Higher inventory functions like debt. Just as debt is future consumption brought forward, inventories are future sales brought forward—at least in terms of GDP accounting. The first quarter’s sharp investment growth was partly a response to the corporate tax cut passed last December, which included several provisions intended to produce exactly that effect. I said at the time it would work for a while but probably fade, and it is doing so faster than many of us would like. Now, I don’t necessarily expect tax policy to drive business decisions. You invest in expanded capacity when you think it will produce revenue, and the costs will let you still make a profit. Taxes are only part of that decision and probably not the most important part. Ultimately, businesses expand and hire when they think consumers are ready to buy their products. The problem is that strong GDP growth forecasts assume businesses will make the kind of investments it now appears they are not. If so, then we may look back and see this year’s second quarter growth of 4.2% was the peak, and it’s downhill from here. The Atlanta GDP estimate now shows 2.4% for the fourth quarter. My personal opinion is we will be lucky to average 2% in 2019. That doesn’t mean growth will drop all the way to zero or below. I can imagine a few more years of sideways-to-flat conditions. It wouldn’t be the worst thing in the world. But if that’s what we get, some stock investors will be mighty disappointed because share prices are assuming much more. As I’ve written, and as my friend Dr. Lacy Hunt has demonstrated from the economic literature, increasing debt becomes a drag on an economy, especially after it rises over the 80 to 90% of GDP level. US government debt is now 106% of GDP, and if you add state and local debt, which causes similar drag, total government debt at all levels is over 120% of GDP. Shades of Italy and Greece. Our current prosperity is built on an explosion of debt; it is therefore unsustainable. The US added roughly $1.3 trillion of GDP in the fiscal year that ended in September but also added $1.271 trillion of debt. Interest rates, while still running well below real-world inflation, are rising in a heavily leveraged economy. The $1.271 trillion increase in federal debt was nearly $500 billion or 39% higher than the official annual deficit of only $779 billion, which means that politicians are keeping significant amounts of debt off-balance sheet. I don’t know who they think they’re fooling, but they aren’t going to be able to keep this con game running much longer. Over the past five years, the official deficit was reported as $2.977 trillion whereas the federal deficit grew by $4.777 trillion, meaning that 38% of the actual shortfall was hidden by our feckless leaders. And all of these figures do not include trillions of more dollars of off-balance sheet entitlement obligations promised by the government to future retirees and other voters. That deficit was for fiscal 2018, which ended on September 30. The CBO’s latest projection is we will add close to $1 trillion of debt in 2019 and over $1 trillion in 2020. If the Democrats take the House next week, even narrowly, is there any real hope of cutting that deficit without tax increases? Which both the Senate and Trump will not accept? The off-budget deficits have averaged around $360 billion for the last five years, generally increasing over time. But if we take just that average and add them to the projected deficits, the US government deficit will be (drumroll, please) approximately $1.4 trillion per year for the next five years, which will mean $29 trillion total debt by 2024. And that’s without a recession. Throw in a recession, and we’ll get to $30 trillion long before then. Care to speculate what interest rates will be? What quantitative easing will look like? What all the other market disruptors will look like? As Mr. Rogers might like to say, can you spell volatility, boys and girls? In fact, let’s close this letter talking about volatility and liquidity. My friend Chris Cole at Artemis Capital in Austin occasionally writes a rather brilliant client letter. He graciously sends it to me. I’m going to share the full letter in Over My Shoulder soon, but here’s a quick bite. Chris notes the above story about the two young fish not being aware they are swimming in water, and suggests most investors are doing the same. We have been swimming in a sea of liquidity for so long that we notice it only when it disappears. Then central banks provide more liquidity, and things go back to what we think is normal. In markets and in life, we swim in mediums of thought abstractions… the same way a fish swims in water. When the medium collapses, so does the reality… causing us to question the nature of both. As Foster Wallace eloquently explains, “The immediate point of the fish story is that the most obvious, ubiquitous, important realities are often the ones that are the hardest to see and talk about.” Volatility is always the failure of medium… the crumpling of a reality we thought we knew to a new truth. It is the moment where we learn that we are a fish living in a false reality called water… and that reality can change... or there are other realities. True volatility isn’t the change of the thing, it’s the changing of the medium around it and the realization that the thing never really existed in the first place. This is all you need to know to understand when the volatility storm will truly come. It is not about valuations, money printing, or where the VIX is at any point. When the collective consciousness stops believing growth can be created by money and debt expansion, the entire medium will fall apart violently, otherwise it will continue to be real. The belief that the medium is the reality is what holds the edifice together temporally. You might dismiss this as way too bearish. Maybe it is, right now and for the next few years. But when global debt starts suffocating economic growth and impinging on liquidity, or central banks react with too much liquidity, then the relative Sea of Tranquility in which we have been swimming could become quite tempestuous indeed. That is why I keep harping on The Great Reset. Going back to the first quotes, we are going to relive or at least rhyme with history. I think we will set a new standard for what the word volatility (absent a shooting war) really means. IRAs are almost as common as cell phones. Nearly every investor either has one or has some other kind of plan that can pour into an IRA. It’s the tax benefits that make them so popular. But few investors work their IRA as hard as they could. A lot of opportunity for tax savings slips by. And that means a lot of opportunity for building wealth slips by. Starting next week, I’m going to try to fix that. That’s when we start a series of short articles showing what’s really possible with an Individual Retirement Account. They’re written by my friend and colleague Terry Coxon who is not only knowledgeable but is passionate about the topic. 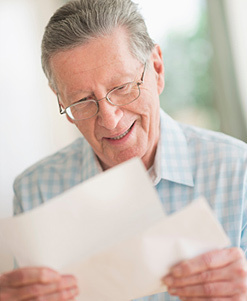 Terry has also prepared a comprehensive guidebook on getting the most out of your IRA. He calls it Supersize Your IRA. I call it Work Your IRA Like a Mule. It’s available for a limited time—just one week only. You can learn more about his guidebook here. In theory, I will be doing my final edits to this letter on a plane to Frankfurt, Germany. We are supposed to have Wi-Fi, so I will do a little work before going to sleep. I now try to get to Europe at least one day earlier than I used to, as adjusting to jet lag seems to be getting more difficult for me. I am really looking forward to this conference, as I expect to learn a great deal more than I impart. I have as many questions as they do. The next weekend, I will be in Georgia for a few days before returning home to prepare for Thanksgiving with all my children, friends, significant others, and grandkids. Also in theory, I should soon have my new golf clubs to break in. Or maybe to break me. We’ll see who surrenders first. And now, it is time to hit the send button. Have a great week! Mine looks to be busy and informative.